The Lecture Series of the Australian Mathematical Society commenced publication in 1984. It aims to cover all areas of mathematics whilst focussing on the needs of Australian University curricula. Books in the series will be appropriate for undergraduate, honours and first year graduate levels,as well as providing access to new areas for mathematics professionals. 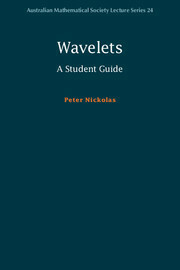 The series has a particular emphasis on texts developed from areas in which Australian mathematicians are strong in either research or teaching. The Lecture Series is published by Cambridge University Press and more information, including a list of recent publications can be found on the CUP web site. The Editorial Board is very keen to receive submissions of monographs or just proposals for a text. These should be sent to the Editor-in-Chief, Prof. Jacqui Ramagge, at lectureseries@austms.org.au. Once you decide to make a full proposal, please consult the information page. The Editorial Board would appreciate your addressing the areas discussed there to help us make a quick yet well-considered decision, on your proposal. Prof. Jacqui Ramagge (Editor-in-Chief, University of Sydney).